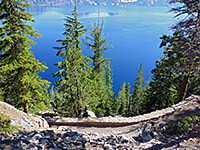 Climbing down to the water's edge might seem an obvious goal at Crater Lake, but most of the rim slopes much too steeply and is formed of loose, unstable rocks, so off-trail hiking is not permitted, and the only way is via one maintained path; this is the 1.1 mile Cleetwood Trail, on the north side of the lake. The route descends a relatively shallow part of the rim, where the lake surface is just 700 feet below the plateau, though even here the ground is very steep (a 50% gradient), so the path has several long switchbacks, through a forest of tall fir trees, emerging at the lakeshore near a small rocky beach, bordering Cleetwood Cove. This is also site of a boat launch pier, from where trips around the lake depart; most people who take the trail are here for the tours, through the trail is well worth hiking just for the views. 10 views along the Cleetwood Trail. 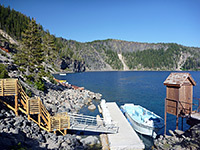 Because of the popularity of the Crater Lake boat tours, the Cleetwood Trail has a very large parking area accommodating several hundred vehicles, on the north side of the Rim Drive 4.5 miles from the junction with the North Entrance Road. Boat tickets are available from a staffed kiosk, and on popular days all may sell out by lunchtime. Loop tours of the lake depart five times a day during summer (late July to mid September), while another two daily trips lead to Wizard Island. The Cleetwood Trail is dusty, well used, and wide, enough to accommodate small tractors and other NPS maintenance vehicles. The steepest sections are at the beginning and shortly before the end, and all is through cool, forested slopes, home to ancient red fir trees that allow very little sunlight to reach the floor, even though the hillside faces south. The trunks of many trees are partly covered by bright green moss, concentrated in the few places where the sun does occasionally shine. The path starts with a few short switchbacks, traverses westwards a way, rounds a promontory, cuts back east then finally turns west again as the trees fade away, and descends past exposed lava cliffs to the bouldery shore. The boat launch area is round the next corner, while just beyond extends a short section of accessible shoreline including a sheer-sided rock good for jumping off, and a stony beach. 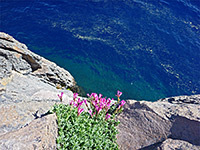 This is bordered on the west side by a vertical cliff face, making it impossible to walk any further along the water's edge. Despite the low temperatures, many people swim and dive in the lake; the great depth close to shore is evident from the rich blue color of the water. The place is also a popular fishing spot. There is rather a lot of construction around the end of the path - stone walls, wooden fences, boardwalks, cabins, etc (the facilities were enlarged and rebuilt during summer 2011) - so the place is no longer very natural, but the lake views are quite spectacular.